With the start of Lent comes the start of meatless Fridays. Dinners like the Crock Pot Parmesan Chicken I shared the other day are going to be missed on Fridays, but that’s not to say dinner still can’t be delicious. Out with the meat, in with the extra veggies! For me, a good meatless meal must include lots of vegetables to fill me up. Instead of replacing meat with carbs, vegetables add color and plenty of nutrition. I don’t buy brussel sprouts often, I seem to forget how much I like them. But they are way up there on my list of favorite vegetables. I have already talked about that here, so we don’t have to talk about it again. 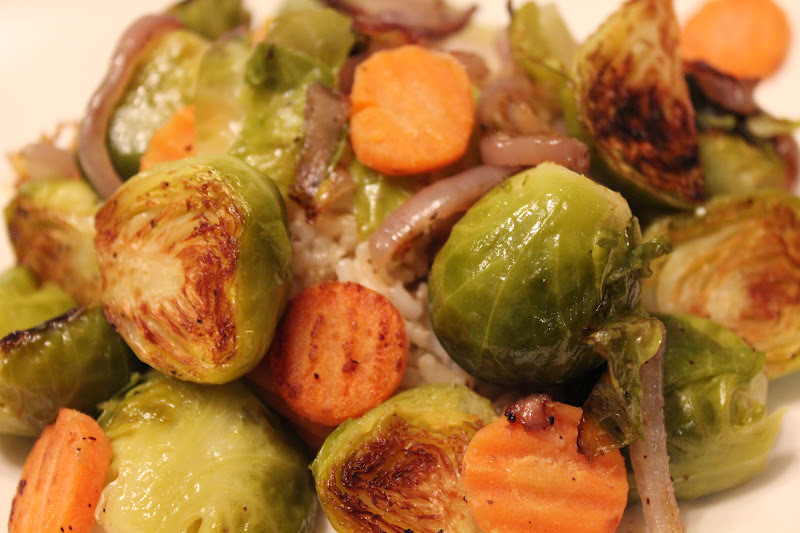 In the past I have stuck to sauteing brussel sprouts (and most other veggies for that matter), but with proper planning for cooking time, roasting is the way to go…as proven by this meal. 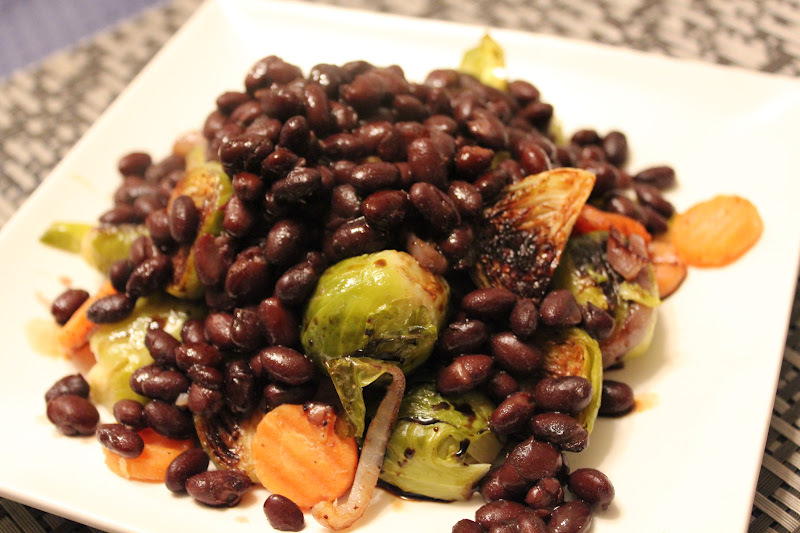 I roasted a variety of vegetables, added them to a pile of steamed brown rice, then topped the plate with black beans. 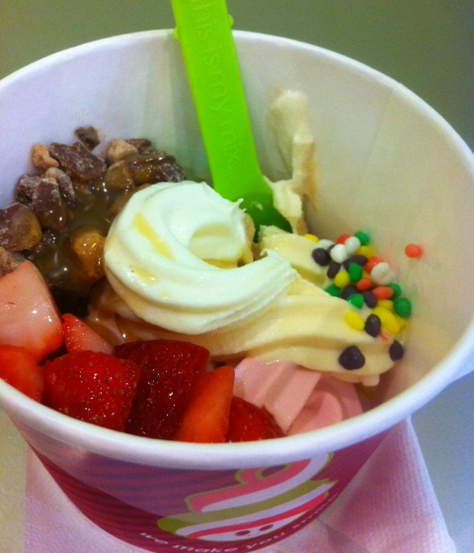 Lots of colors, lots of flavors and lots of vegetarian yumminess. 2. Spread out all vegetables in an even layer on baking sheet. Brush olive oil across vegetables and sprinkle with salt and pepper. Use a spatula to gently mix-up vegetables. Cover baking sheet with foil. 3. Roast 40-45 minutes, checking half way through to flip vegetables around. 4. Remove from heat, add more salt and pepper to taste if needed, and serve immediately. Serving suggestion: Add to cooked rice, beans or pasta. Sometimes I think I could be a vegetarian. But then I realize that is just crazy. What am I thinking? Especially with Thanksgiving coming up. I need that turkey in my belly! And honey-glazed ham. Any chicken is one of my favorite things to cook. But seriously, there are plenty of vegetarian meals that are just as satisfying as meat-filled meals. Veggies, beans, eggs and potatoes can make great dishes. Something like this without the chicken would still be delicious. But I think it’s only natural, and healthy, that humans eat meat. And I’m not going to mess with nature. The other night I had to skip the meat and stick with the veggies. I did have chicken in the freezer, but for some reason I despise thawing meat. I don’t know what bothers me so much about it, but I really hate that task. With fresh brussel sprouts in the fridge and a sweet potato calling my name, I came up with a great meal. 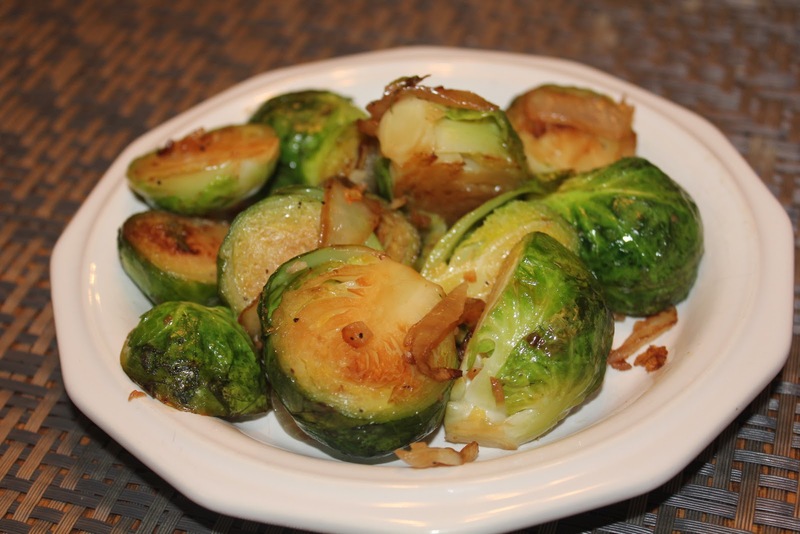 After getting the potato in the oven to bake, I got to work with the brussel sprouts. 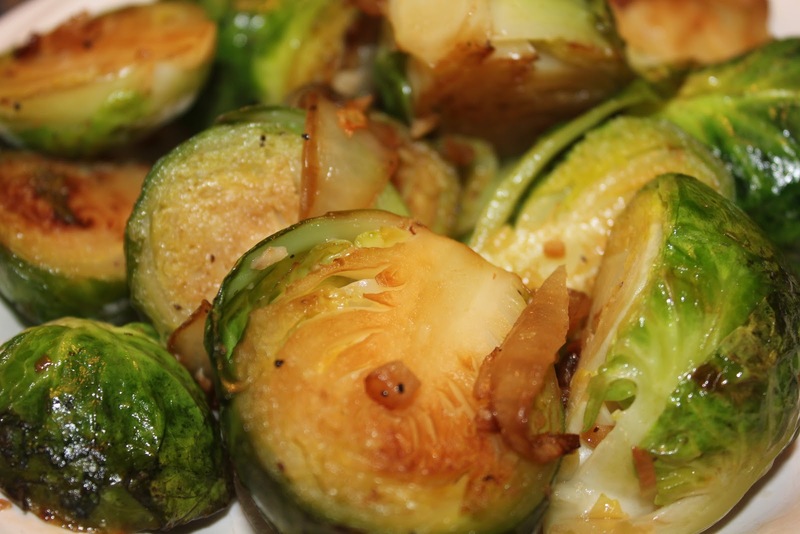 I love the texture of brussel sprouts. When cooked, they are crunchy, yet tender and dense (I think that accurately describes them??). They say vegetables are best in their raw state. Who is “they” anyway? Health experts, I guess. That might be true, but I like to think that by adding a healthy amount of olive oil, onions and garlic, my brussel sprouts are even healthier! Who would eat a raw brussel sprout anyway? This is one vegetable that I would not want to eat raw. The sprouts went perfectly with my baked sweet potato. Greg originally gave me a look of disgust when he saw me cooking the veggies, but after forcing him to try a bite, he actually approved! Since he hadn’t trusted me to begin with, he made himself something else for dinner. But I think in the future he will be joining me here. 2. When hot, add onion and garlic. Stir and cook for about one minute. Add brussel sprouts and stir to evenly mix with onions and garlic. Let cook 3-4 minutes without stirring. 3. 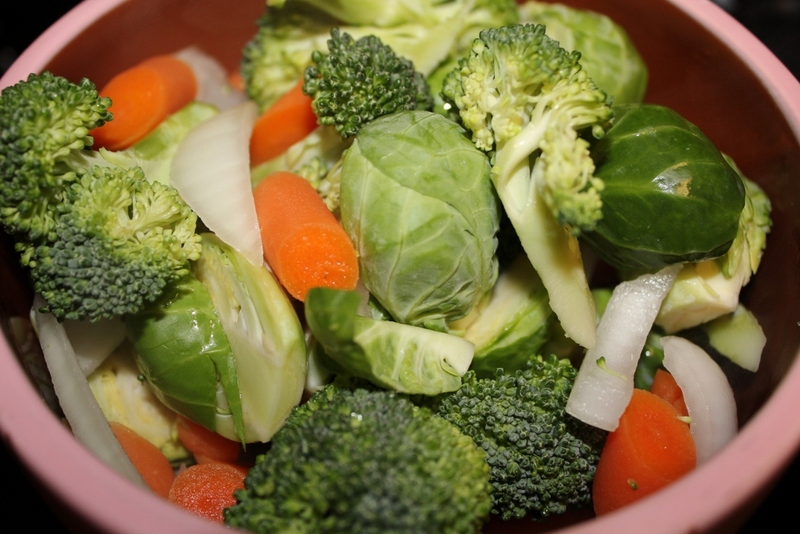 As sprouts being to brown, add salt and pepper and stir frequently for another 5-6 minutes for even cooking. 4. Remove from heat and serve hot. I always forget about Asian food. Whenever I am trying to come up with what to make for dinner, it rarely enters my head as a possibility. I mean, the only thing I can really make that can be classified as Asian is stir-fry. But there are 275309485 different combinations and ways to make stir-fry. Yes, I counted them all. Each of these ways can taste completely different depending on the ingredients you use. I had some newly-purchased brussel sprouts in the fridge and was thinking of what I would do with them. Then I realized I actually had a variety of fresh veggies that needed to be used. Onions. Broccoli. Carrots. Perfect for stir-fry! My dear Asian food, I will not neglect you any longer! I cut some chicken breasts into chunks to add to the mix as well. 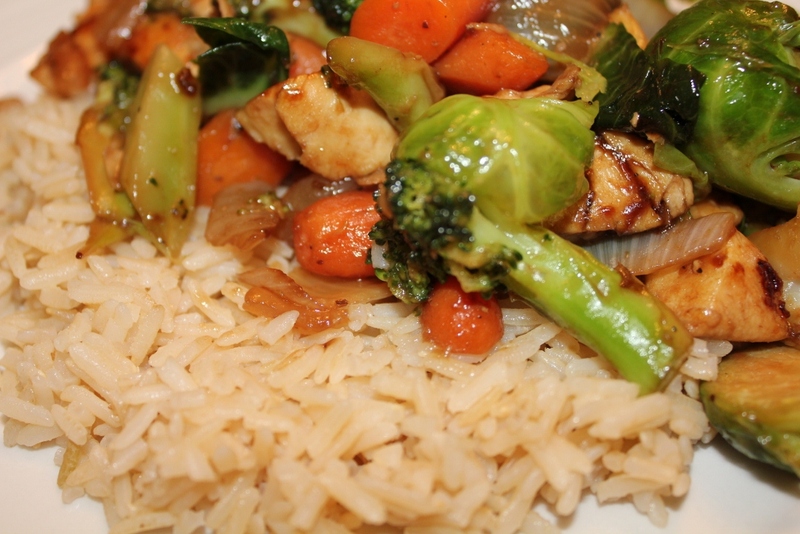 I topped it off with a thickened soy sauce and served on top of brown rice. 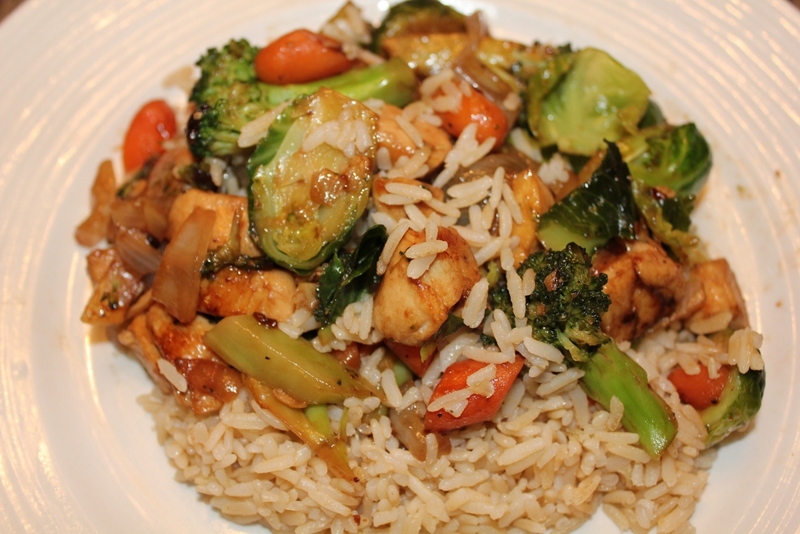 Everything about this dish- the veggies, chicken and rice- is healthy. Full of fiber, protein and vitamins. From a lot of health magazine reading that I do, I have learned one trick to be sure you are getting plenty of vitamins and minerals is to look at the colors on your plate. Too much brown and white…not so good. Wide variety of bright colors…muuuuch better. It just so happened that a lot of the vegetables I had on hand were green. Ideally, I would have liked some red bell pepper or yellow squash for even more color, but the greens were deeee-LISH! 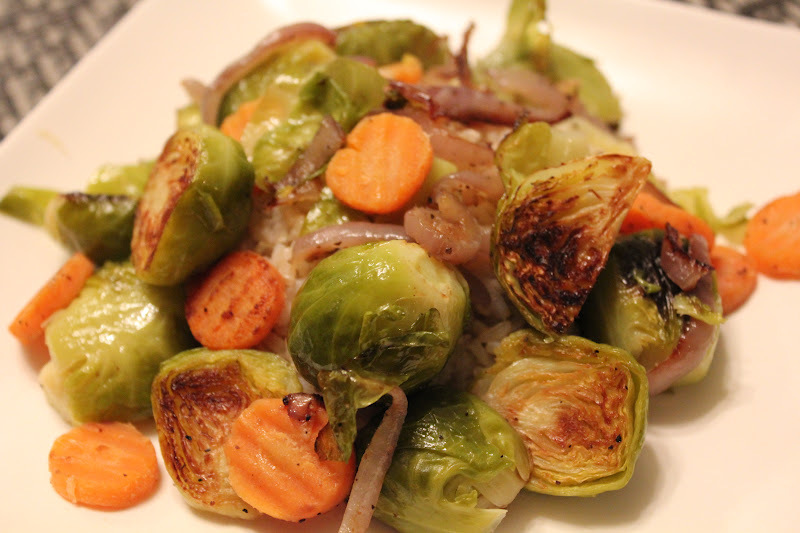 This was my first time making anything with brussel sprouts and I loved them. I can’t explain it, but the texture just hits the spot for me. I finished this entire plate-full and was perfectly satisfied….for about ten minutes. But not because I wasn’t full, I just needed dessert! 1. Cook rice according to package directions. 2. Prepare the sauce by stirring cornstarch and soy sauce in a small bowl. Set aside. 3. Heat the olive oil in a large skillet over medium heat. 4. Once heated, add the chicken breast pieces and cook until almost done, about 4-5 minutes. 5. Add vegetable mixture and water to the skillet. Stir ingredients well and cover for about 3 minutes. 6. Remove lid, add sauce and stir. Continue to cook for another 7-8 minutes, or until vegetables are tender. 7. Serve meat and vegetables over rice. Note: All meat and vegetables can easily be substituted with whatever you have on hand. Even frozen vegetables will do.